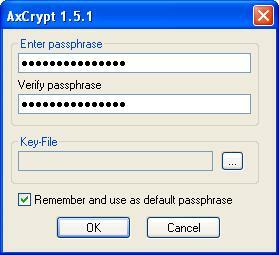 AxCrypt is a file encryption program that uses the AES algorithm with 128-bit keys. It combines strong symmetric encryption with compression and double-click editing. Encrypted files have a ".axx" extension added to their names, and are shown with a new icon. After one of my encryption utilities failed to work on Windows-7/64-bit (it does work on XP/32-bit) I tried AxCrypt and was very pleasantly surprised with how good it was. Especially how reliable and crash-free it was at encrypting whilst the PC was heavily loaded with other activity/programs. Encryption activity can send a PC/CPU to max 100%, in these circumstances either the encryption package itself can fail or that during 100% machine usage it fails to write the encrypted file to disk--thus one can be left without a useable file--one that can be decrypted, thus the user has permanently lost data. In this regard, I found AxCrypt faultless, it worked perfectly. For me, the main requirement was that it must work on-the-fly from the context menu and this is passes with flying colors. As with most encryption packages, without actually watching the compilation process from known good source code, one has to take the downloaded binaries at face value. That said, the investigation that I've done (the net, hearsay, other users, my testing, developer's website etc.) all indicate that this package is both good and as secure (no back doors etc.) as its developer says it is. Operationally, AxCrypt is very solid in the useability stakes. Outside specialized secure environments, military, banks etc., I'd have no hesitation in recommending this very solid encryption package to all users. The features of this program are more than sufficient for my needs. Combined with TrueCrypt there's little more to ask for. Bug fixes, see change notes. in batch files via the command line. filenames (legacy versions will use translated name). stored in Ansi only, will be fixed in next version. environment to Visual Studio 2005. Vista support in installer and code. I am currently using version 1.6.3 so this speaks about that. I have been using Axcrypt for single file encryption several years now, always with good results. Something I don't see in the homepage of Axcrypt is a version changes list. It appears that all of the features listed in 1.6.4 I already have in 1.6.3. Perhaps the release is correcting bugs, although I have never encountered any. Very solid and reliable. It easily covers the basics of file encryption without all the overhead like you get from PGP these days. To be perfectly honest advanced file security 3 on it's first try has done better than any other free encryption program to date. If for no other reason than it will handle folders too and is entirely portable. fine crypt (crippled) will do a max of 5 of anything for free. There is literally nothing else (i know of) that encrypts folders for free. Further changes to make it more Vista-aware. The largest change is re-compilation as a full Unicode application and dropping support for Windows 95, 98, ME and NT. We're no open for translations to more languages, as we're not limited in the texts. Filenames are still stored in Ansi only, will be fixed in next version. I use to encrypt files and "forget" about them for a long time. From time to time I find myself needing the content of such an encrypted file. And one thing I would hate is finding out that the file is damaged. That is why I suggest beta-testing it on a virtual machine , with already backed up files or just test files. That is what I will do. I was very hesistant to try this program since I already use TrueCrypt (the BEST volume encryption app hands down), but I am VERY glad I listened to the people here. AxCrypt, indeed, has different uses than TrueCrypt. It also has some beautiful features that I'm happy to see. great program for on-the-fly single file encryption! Great little program to ecnrypt files on the fly. AxCrypt is nothing new. It is a tried and true program. It is the best I have found and I've looked high and low at other programs. Most are too complicated with their "containers", "drives", and options. It all depends on how often and how much you are going to encrypt. If its 'quick and dirty' then Ax is the best. If you need a big chunk of hard drive encrypted then you can look at the container/drive applications. Right click a file and pick "axcrypt". Enter your password and a new, protected file is created. Very simple and fast. I've tested Ax on very big files and it works fine. Many archive tools have encryption capability. This is fine but it is very slow. Not only are you encrypting but you are also compressing. Accessing these files again is another slow process. Truecrypt is another popular program but you will spend a lot of time learning to use it. AxCrypt may be called by other programs, or manually, by specifying command-line arguments.